Please note that this is a teen theater workshop and requires students pay a tuition fee. MIDDLETOWN, CT. 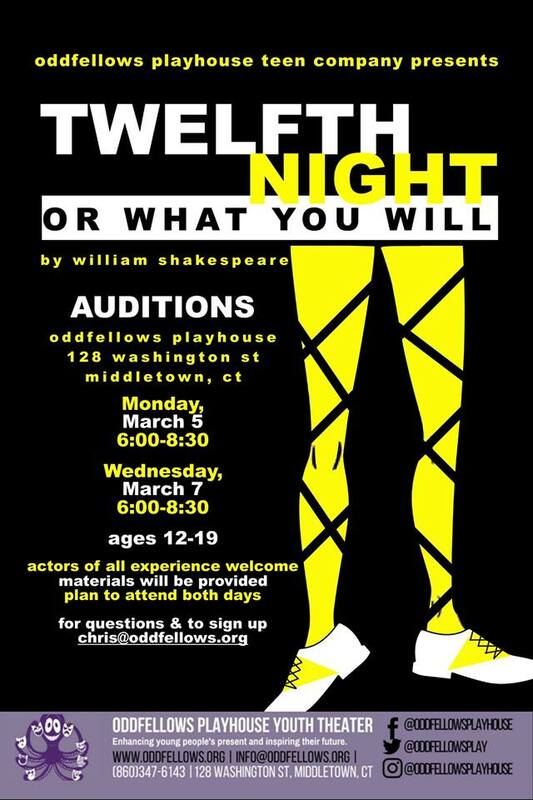 The Oddfellows Playhouse Teen Company will be holding auditions for William Shakespeare’s TWELFTH NIGHT, OR WHAT YOU WILL on Monday, March 5th & Wednesday, March 7th at 6:00pm, with performances opening Thursday, May 3rd at 7pm. Performances will continue through May 12th. Full schedule available at www.oddfellows.org. Open to all actors aged 12 –19, interested teens should plan to come both nights of auditions. Expect to join into games, read from prepared texts and get to know other young actors in the area. This production will transport audiences to Shakespeare’s Globe Theater along the Thames in London for an evening of “traditional” theater – loud, fast-paced, and riddled with hilarity! Appropriate for all ages the production will feature set, lighting, costume, and sound design by professional theater designers. All performances will be at Oddfellows Playhouse, 128 Washington St. Middletown, CT. Tickets are $8 for students and seniors, and $15 for adults. “Shakespeare is often associated with being boring, uptight, and difficult to understand, but the original purpose of his plays was to give the general public a means to poke fun at the aristocracy and upper class. The goal of this show is to bring that energy back and give both our performers and audiences a new outlook on the accessibility, timeliness, and humor that keep his plays relevant more than 400 years after they were penned,” says director Chris Coffey. The Teen Company at Oddfellows Playhouse is open to youth ages 12 – 19. The company produces 2 – 3 mainstage productions each year, auditions are open to all and actors who commit to the process are cast in a speaking role. Tuition is $250 and sliding scale, work-study, and/or full financial aid are available to any student in need.